Beaumont Health in Southfield today announced Max and Debra Ernst of Orchard Lake have increased their support to heart and vascular care to a total of $8 million, launching the new Max and Debra Ernst Heart Center at Beaumont Hospital in Royal Oak. The latest gift totals $5 million. The center will be dedicated to consolidating cardiac care, particularly for patients with heart failure, into an area that is not only convenient but comprehensive to provide a variety of heart and vascular services. In 2009, the couple gave $3 million to open the Ernst Cardiovascular Center in Memory of Ellen Ernst. “Through their incredible support, Max and Debra have demonstrated that it doesn’t take a medical degree to save a life — all it takes is a heart and a desire to help others” says Dr. Marc Sakwa, chief of cardiovascular surgery at Beaumont in Royal Oak. 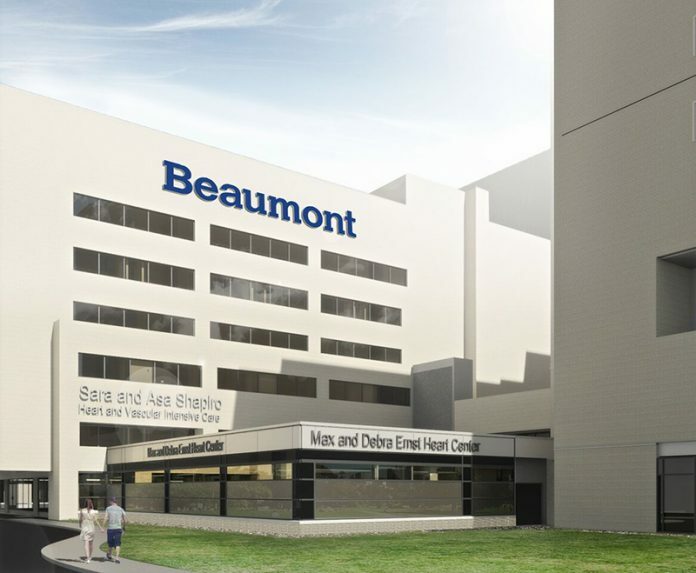 The 14,000-square-foot Max & Debra Ernst Heart Center will be located adjacent to the East Tower entrance of the hospital near the current Ernst Cardiovascular Center. The new $9 million center will consolidate many outpatient heart services into one area to help cardiac patients — particularly those with heart failure — better manage their condition and reduce emergency center visits and hospital readmissions. Construction began on the new center this month. It will open in the fall of 2019. Across the nation more than one million people are diagnosed with congestive heart failure each year, which may lead to poor quality of life and frequent hospitalizations for advanced care. Heart failure is also the leading cause of hospitalization for those 65 years of age and older. Board-certified cardiologists, trained cardiac nurses, social workers, and dietitians will provide medication monitoring, heart failure management, and progressive therapies to not only improve symptoms but enhance quality of life. The services will be provided with compassionate and specialized patient and family-centered care in a convenient and easily accessible location for patients requiring more support. The success of the first Ernst multidisciplinary center, which offers many services including low-cost, preventive heart screenings for adults and high school students, has created the need for expansion. Since the center opened in 2010, specialists have cared for more than 30,000 patients. The facility has become one of the premiere programs for structural heart and valve disease, and cardiac surgery.